up….there is no Christian left,” said Rajeshwar Singh…. Just say NO to any C21 sequel of Babri the horror movie. The powers that be are of the opinion that beating up on minorities will help win elections. This is from the Gujarat playbook but the success there was more out of a sense of Gujarati asmita than Hindu pride. Already there is evidence (recent by-polls in Uttarkhand, Bihar, and Karnataka) that a backlash is taking shape. Finally, people who live by the sword must be prepared to die by the sword as well…a number of ruling party leaders/workers in UP have been murdered in the past few weeks. 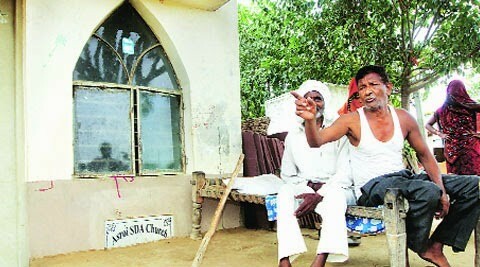 As far as the Valmikis (Dalits) are concerned, the important question is how they survive in difficult conditions not their status as Hindus or Christians or Muslims. Religious status is not helpful for improving social status….otherwise there would be no need for separate Dalit Christian burial grounds and Dalit Muslim Mosques. festivals he supports with so much enthusiasm). Another contentious issue is foreign money. We do not like Hindu NRIs or Christian Evangelicals or Wahabi Saudis to fund extremists in India and contribute to social disharmony. Religion is one of the most moneyed businesses in India, if people really want to fight conversion battles they can/should fight with local money. Finally while we are not enamored of constructing yet one more temple or mosque or church, is it OK to insist that these folks first pay up for a 1000 toilets? And while they will be responsible for maintaining the place of worship, they should also take care of maintenance of the toilets. Call it the Temple-Mosque-Church-Toilet scheme (Yojana). meet and the worry about the future of his children continue unabated. become Hindus again,” he said. appropriation of the church spread tension in the area. off “and kept in a safe place.” The belongings of the church – a cupboard, Christmas-lights and a single copy of the Bible – has also been kept in a locker. time, had received an overwhelming majority of the votes in the village. here,” said Vikas Choudhury, pradhan of Asroi. that it was not simply a matter of faith, but also economics. Adventists. That organization then built a church for its new converts. to other religions, and attempt re-conversion. “taint” in Aligarh. A Shiv poster was put up in the church, but later removed. The alarmed Seventh Day Adventists locked up the church. came from Uttarakhand for the re-conversion. people to their respective faiths. distinct financial advantage in India, and can easily outbid Christian ones. church, which belongs to the Seventh Day Adventists. faiths are equal, and none can be discriminated against.